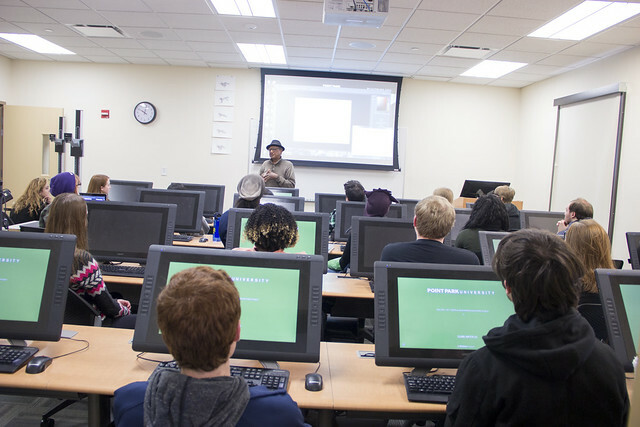 Floyd Norman - Disney's first African-American animator who is known for his work on Monsters Inc., Toy Story 2 and The Smurfs - held a master class at Point Park University with animation and visual effects majors Nov. 12. "It was a life-changing experience to meet the man who helped pave the way for aspiring African-American artists," said Kieauna Jefferson, a freshman animation major from Farrell High School in Farrell, Pa. While sketching black-and-white animations of Disney characters like Mickey Mouse and Goofy, Norman shared memories from his career, encouraging students to work hard, be persistent and never give up. "To hear Mr. Norman talk about his experiences and anecdotes about Walt Disney himself made for an unforgettable day," said Cieara Niespodzianski, a sophomore animation major from Brentwood High School in Brentwood, Pa.
"After attending Mr. Norman's master class, I learned that a career in animation relies on perseverance, creativity and a deep passion for storytelling," said Noah Ondik, a sophomore animation major from Hopewell Senior High School in Hopewell, Pa. In addition to the master class, the Point Park community had the opportunity to attend a screening of the feature documentary "Floyd Norman: An Animated Life," followed by a question-and-answer session with Norman. "I hope the students who heard Mr. Norman speak feel energized and excited about working in animation," said Jonathan Trueblood, assistant professor of animation and visual effects. "It's a very hard industry to break in to, but it's also very fun and something they can do the rest of their lives!"